By 9pm, the tent set up in the Logan Center for the Arts at the University of Chicago’s central courtyard was jostling with people. Outside it drizzled miserably, as it had all day, although this did nothing to deter the crowd. Emily Hooper Lansana, the Logan Center’s associate director of community arts engagement, must have been right when she introduced the next act as “magnetic.” A slice of Chicago was packed into that tent, ready to give some of their own a proper homecoming. After all, it’s a rare feat that the South Side-born and raised members of the Hypnotic Brass Ensemble—all of them children of the jazz legend Phil Cohran, and on the road to becoming legends in their own right—return to play a free set for their native city. The Hypnotic set was the capstone to a twelve-hour bonanza celebrating the Logan Center’s five-year anniversary. The whole thing was free, not just the jazz. Starting at 11:30am on that Saturday morning, Logan had become a hive of activity. 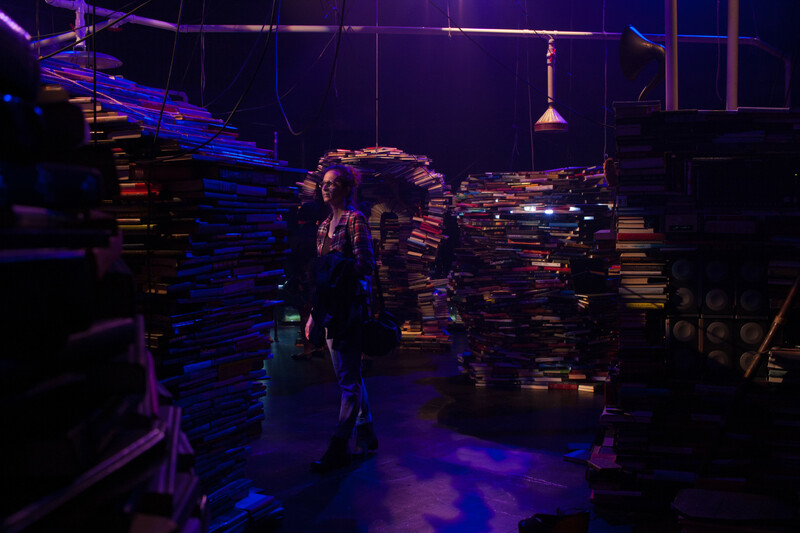 Programming throughout the day, which spanned all imaginable media, was a healthy cross-section of the art being produced by the Logan community—which includes UofC-affiliated artists, as well as artists and organizations with whom Logan has formed partnerships. Festivities kicked off with the Gwendolyn Brooks Youth Poetry Awards, organized by Illinois Humanities in partnership with the Logan Center. As part of the citywide Our Miss Brooks 100 centennial celebration of Brooks’s birth, the award program that she herself ran for many decades was revived. Aspiring writers from kindergarten to twelfth grade participated in the contest; winners hailed from all over Illinois, all the way from Aurora to Galesburg to our very own Bronzeville. Subsequent workshops, exhibitions, and performances were dispersed across the Logan campus throughout the day—many of which were interactive, and many in a family-friendly way. 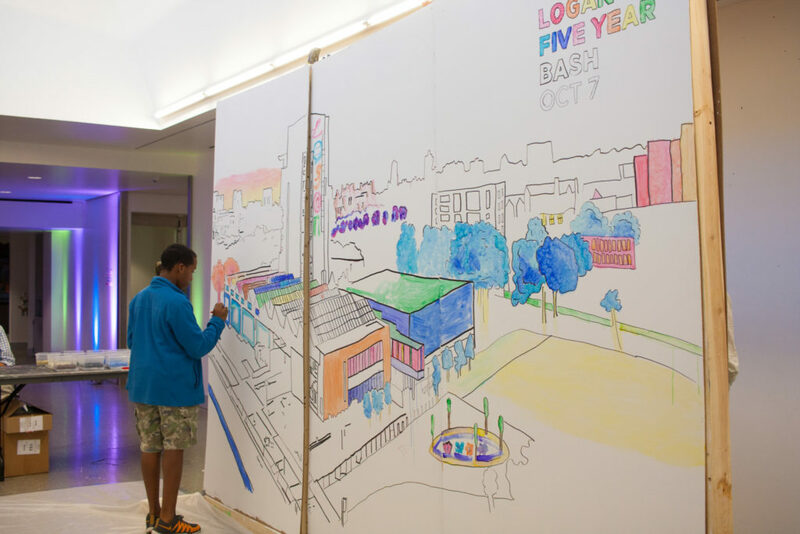 Kids eight and up got to animate their own Lego movie from 2pm–3pm; all day long, attendees who found themselves on Logan’s second floor could contribute to the making of a mural. And at 4pm, the UofC student arts organization Kitchen Sink—which provides free art supplies in the Logan Great Hall every Wednesday night for anyone who would like to use them—led families in a costume-making activity, followed by a parade about Logan (adorned in said costumes). To be sure, the Logan five-year bash was an eclectic affair—age-wise, medium-wise, and, pleasantly, demographics-wise; while the University of Chicago isn’t known for being overly welcoming toward its neighbors on the South Side, attendance was by no means limited to UofC students and faculty. Bill Michel, executive director of both the Logan Center and the broader UChicago Arts program, told me that in respect to the broader attendance, the festival was a good representation of the trajectory he and his colleagues have been trying to chart for Logan over the last five years. “It was important to us from the beginning that [the Logan Center] was a space…that supported the work of our students and faculty, but also became a very important part of the arts and cultural community of the South Side,” Michel said. Administrators like he and Hooper Lansana have sought to make Logan into such a space in large part by forming partnerships with artists and arts organizations based in the South Side. Art programming paused briefly at 5:30pm for a portion of the festivities called “Celebrating our Partners,” at which point Michel gave thanks to some of those that have worked closely with Logan in the past half-decade: Diasporal Rhythms, Rebirth Poetry Ensemble, and the Africa International House are all South Side-based arts organizations that received shout-outs during the night. What’s clear is that, regardless of origin, many artists have come to call Logan home—it is for Avery R. Young, a musician, poet, and teaching artist affiliated with UChicago’s Arts and Public Life initiative, headed by Theaster Gates. But Young does a lot more besides his work directly linked to the UofC: running programming for the youth-oriented Rebirth Poetry Ensemble out of the Logan space, for example, or recording his album in the center’s music studio. He and his band, De Deacon Board, took to the courtyard stage shortly after Michael’s talk to perform a style of music that they coined as “sousefunk”—a genre-defying mix of jazz, soul, funk, and gospel which Young developed over his five year stay at the Logan center. His demeanor was easy in front of the crowd; one could tell that he was in his element. It is the Logan Center’s unique function—as both an academic arm of the UofC and an excellent resource for artists on the South Side—that has contributed to the incredible vibrancy of the art being made at the center. Michel said it’s a model he intends to continue. “In the next five years, we’re going to be very focused on continuing that work, really focusing on artistic practice, and looking for more opportunities to really support…projects that really benefit from a center that sits at the [crossroads] of the university and the community,” he said. Some of these projects are very near on the horizon. Next weekend, the Logan Center will be hosting its first (hopefully annual) Blues Fest, showcasing the artistry of local and national blues musicians alike. As with the Five-Year Bash, much of the programming will be free and open to the public. “Returns” is another newcomer to Logan programming which will also kick off this weekend: it’s to be a multiyear series of conferences that will look into the implications of the twentieth century pan-Africanist movement for art and culture on the continent of Africa and in the greater diaspora. The future of Logan also holds a continuation of some of the more tried-and-true programs. The Hypnotic Brass Ensemble returned to Chicago for more than just the Bash: on Tuesday, they also participated in the Logan Center’s School Matinee Program, a free series where world class artists come to perform before Chicago schoolchildren and educators in order to inspire a love of the arts. This will be Hypnotic’s second time participating. Hooper Lansana alluded to their first time participating as she introduced the group. “When Hypnotic did our school matinee, they absolutely positively showed out,” she said. “They made our young people feel like they were special. And that says to me that they recognize that the opportunity to touch the stage is more than an opportunity to perform. It is an opportunity to teach, to touch, and to change lives.” It’s that artistic philosophy that may explain why so many artists and organizations—the Hypnotic Brass Ensemble included—were so eager to take to the stage at the Logan Center’s five-year celebration: to give back to the organization that has taught, touched, and changed the lives of not only artists affiliated with the UofC, but those across the city of Chicago.